Classic Italian For A Great Price! 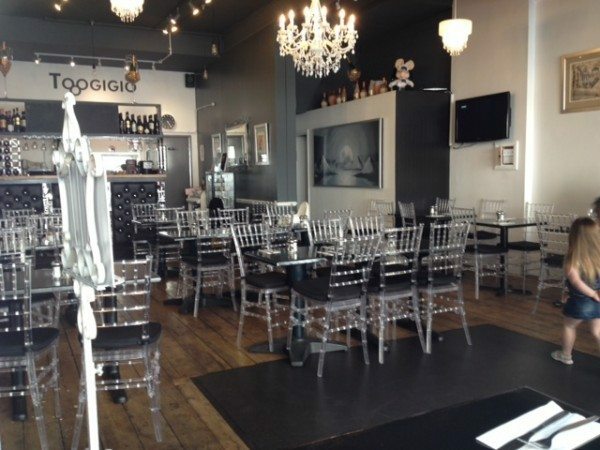 Topogigio, named after an iconic Italian 1960s puppet mouse, is situated on Church Road in Hove, just around the corner from my house. Ashamedly I have to say this is my first visit, although I have been meaning to try it since it’s opening in May. When dining out, I have a tendency to travel into Brighton and as a result, miss out on some of Hove’s finest eateries. Today however – slightly under the weather with a bad bout of man flu – I didn’t fancy donning my apron, so headed to Topogigio to sample their simple, but great sounding, lunch menu. 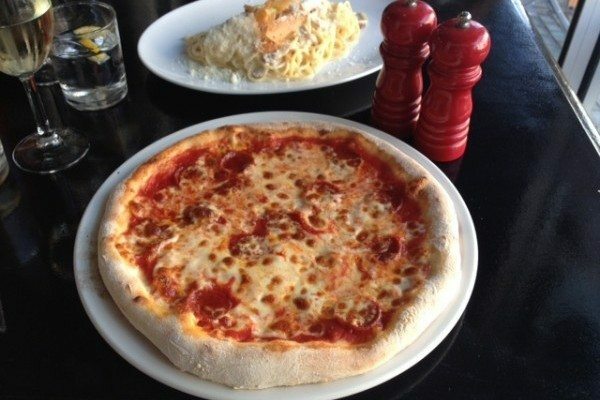 Pasta or pizza – 3 choices of each – and a glass of the house wine for only £6.95, the decision was made! The restaurant creates a feeling of simplicity, with a contemporary, non pretentious vibe. The floor to ceiling windows achieve a great natural light throughout that is very inviting in these cooler sunny afternoons. We are greeted warmly by the host and fortunate to be ushered to our seats right by the window. A lovely spot to enjoy watching the world pass by, enjoying a glass wine and a nice light lunch. both classics and both a great indicator of quality Italian cooking. We both opt for the house white to drink. As this is brought to our table, I take the opportunity to read through the a la carte menu and play the game of choosing ‘what you would have had’. The menu has all the dishes you would expect to see in any great Italian restaurant, from the Pizza Calzone to the Fusilli Alle Vongole Veraci , however there are other dishes just crying out to be tasted. The menu is broken down by starters, meat and fish, with pizzas and pasta fitting in alongside amazing sounding dishes like Swordfish Steak in a light citrus sauce and capers or the chicken stuffed with pesto, ham and mozzarella topped with a sauce made from beer. I am sure that you’re wondering what I will be having next time: the baby crab risotto to start, the roasted sea bass for the main course, and as the desserts board changes regularly I would have had to try their tiramisu – a classic Italian dessert. Our food comes out quickly. We have arrived before the lunch time rush, although I have a strong inkling you wouldn’t be waiting long even on a busy Saturday evening. Everything seems to be running very smoothly at Topogigio. My carbonara looks great. I often think it’s hard to make a pasta dish look elegant, but they pull it off. Adding a touch of fine dining, there are shavings of parsnips crisps on top which also add a great crunch. The pepperoni pizza is stone baked and isn’t greasy, which is not always the easiest thing to achieve with pepperoni. My pasta is perfectly cooked and retained a slight bite, just the way I like it. The carbonara is made the way it should be – just a light amount of cream binding the dish together without leaving a pool on the plate. The pancetta adds a wonderful smokiness to the pasta, and a generous serving of parmesan with a crack of black pepper makes the dish just the ticket for a light lunch. Tasty, filling and highly satisfying. My girlfriend’s pizza has to be nibbled too. For someone that isn’t feeling well she is clearly enjoying the pizza, so I have to get in quickly. A thin base is always a must for me – I’m not a fan of the deep pan and luckily for me, neither are Topogigio. 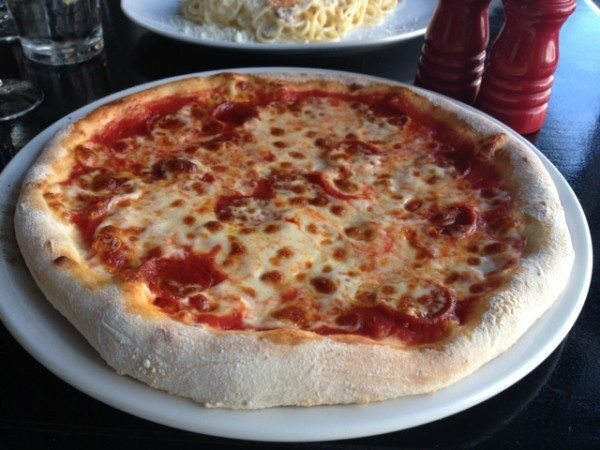 The base is crisp and has the great stone baked flavour, the tomato sauce is warming, rich and slightly indulgent, alongside the pepperoni and melted cheese. A Italian favourite clearly mastered! As we are finishing up I am rather happy, and partly jealous, to see a customer being served the seafood platter. A shell fish lover’s dream – mussels shining and juicy langoustine just asking to be eaten, the smell of the sea filling the restaurant. Fortunately for my girlfriend, I have yet to develop the habit of asking strangers if I can try their food, but I was certainly very close. Though already an enjoyable dining experience, the sight of this platter makes up my mind that I will be back. On a side note, the guy that ordered the platter was provided with his own adult bib to protect his white shirt, enthusiastically taped to him by the host, something new to me which made me smile. 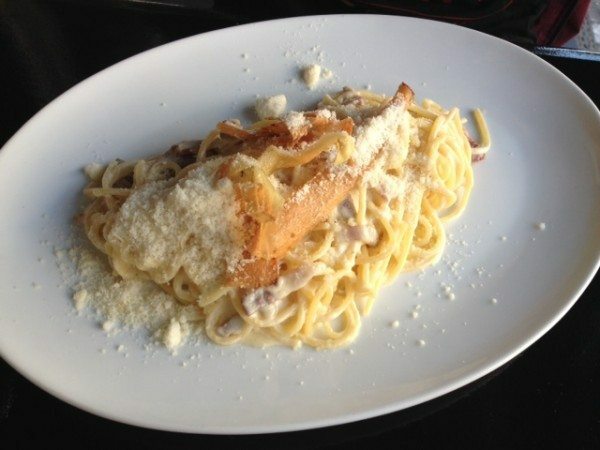 Topogigio is a very welcoming restaurant offering a thorough menu with plenty of variety and meals at reasonable prices. Out host was lovely and the staff friendly. This place is great in the day for a light lunch; I will be back for an evening meal, to sample from the full menu. And for those who like a bit of evening entertainment with their food, Topogigio have live music Friday and Saturday nights. The great selection of pizzas alone make Topogigio a great Hove mid week eatery.